RAW FISH | Who doesn't love some sushi? Sushi is one of my favourite types of food and I thought I would share my love of it with you! It's delicious and also nutritious! Sushi is extremely good for you, and although it isn't every one's cup of tea it's certainly something you should try at least once and give it a chance! 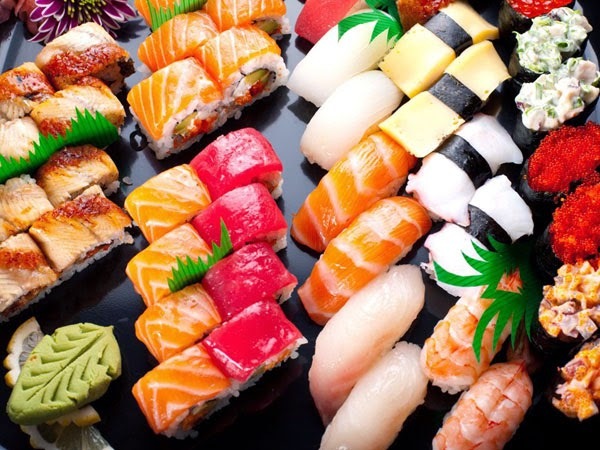 Sushi is a Japanese food which consists of rice combined with seafood, vegetables, and sometimes fruit. It can be made with either brown or white rice, and it's most commonly made with raw seafood but you can get cooked seafood too. Raw fish without rice is called sashimi, and that's my personal favourite. Usually when you order sushi it comes with gari, which is ginger, wasabi and soy sauce. Since sushi is made with raw fish it's very beneficial to your health because raw fish is high in protein, vitamins, and minerals. Lots of the other seafood contains omega-3 fatty acids which have many health benefits. My personal favourite sushi is salmon sashimi, that's raw salmon. I also really enjoy California rolls which is the kind of sushi that most people have tried. California rolls are rolls of rice, with seaweed, avocado, and crab. Sometimes there are fish eggs on the rice but I personally don't like those. Do you guys like sushi? Would you try it now?